AGP President, Atul Bora. and other leaders. File image. Carrying aheadtheirprotestagainst the Citizenship Amendment Bill, leaders from variouspolitical parties from Northeast on Friday called on Shiv Sena MP in the Rajya Sabha, Sanjay Raut in New Delhi. 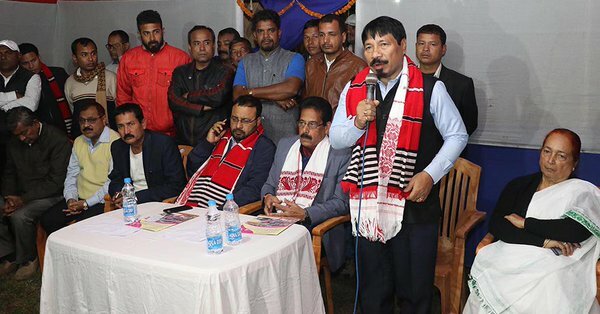 The leaders from northeast included Meghalaya Chief Minister and NPP leader Conrad Sangma, AGP president Atul Bora and leaders Keshav Mahanta, Biren Baishya among others. Significantly, the Citizenship Amendment Bill has not been included in the business of the Rajya Sabha where the current session will continue till February 13. “Shiv Sena will never support any bill which is against country’s interest. I have told the leaders coming from Northeast that Shiv Sena will never support any bill which is anti people,” said Raut to the reporters. “Shiv Sena chief Udhav Thakery has also told that our party will never support any anti-people bill,” said Raut. The delegation from northeast is also likely to meet President Ramnath Kovind, Prime Minister Narendra Modi among others. Their proposed meeting with the Union Home Minister Rajnath Singh got deferred due to the Budget presentation on Friday. “We will meet President Ramnath Kovind, Prime Minister Narendra Modi and raise our demand to withdraw the bill,” said Meghalaya Chief Minister Conrad Sangma. He said that they will continue their tirade against the Citizenship Amendment Bill.